104 years ago this Christmas something happened near the beginning of the “War to End All Wars” that put a tiny little blip of hope in the historical timeline of the organized mass slaughter that is war. Instead, each frontline soldier found himself at the end of his emotional rope because of the unrelenting artillery barrages against which they were defenseless. If they weren’t killed or physically maimed by the artillery shells and bombs, they would eventually be emotionally destroyed by “shell-shock” (now known as combat-induced posttraumatic stress disorder – PTSD). On the German side, a magnanimous (and deluded) Kaiser Wilhelm sent 100,000 Christmas trees with millions of ornamental candles to the front, expecting that such an act would boost German troop morale. Using the precious supply lines for such militarily unnecessary items was ridiculed by the most of the hardened officers, and nobody suspected that the Kaiser’s Christmas tree idea would backfire – instead becoming a catalyst for an unplanned-for and unauthorized cease-fire, orchestrated by non-officers and unheard of in the history of warfare. The mutiny was censored out of mainstream history books for most of the next century. 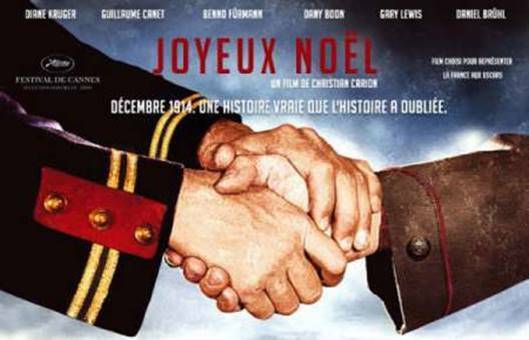 Twelve years ago, the movie “Joyeux Noel” (French for “Merry Christmas”) received a well-deserved Academy Award nomination for best foreign film of 2005. Joyeux Noel is the moving story that was adapted from the many surviving stories that had been told in letters from soldiers who had participated in the truce. It was almost a miracle that the truth of that remarkable event survived the powerful censorship. 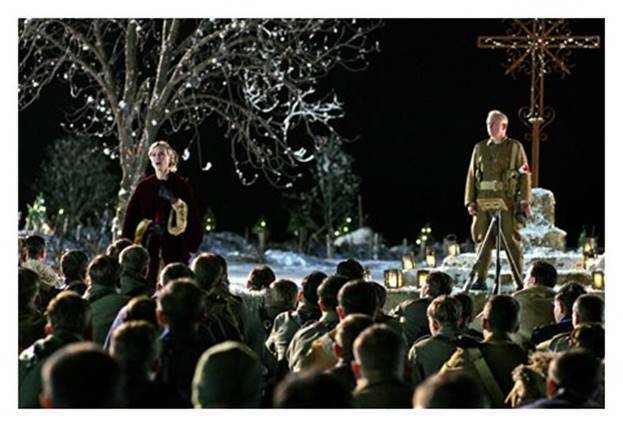 As told in the movie, in the darkened battlefield, some German soldier started singing the beloved Christmas hymn “Stille Nacht”. Soon the British, French and Scots on the other side of No Man’s Land joined in with their versions of “Silent Night”. Other Christmas songs were sung, often as duets in two tongues. Before long, the spirit of peace and “goodwill towards men” prevailed over the demonic spirit of war, and the troops on both sides began to sense their common humanity. The natural human aversion to killing other humans broke through to consciousness and overcame the fear, patriotic fervor and pro-war brain-washing to which they had all been subjected. Both ancient and modern wars have been glorified in every nation’s history textbooks but, if civilization is to survive, war needs to be exposed as demonic. Violence begets violence. Wars are contagious, universally futile, and never truly end; and their extremely high costs always results in a very poor return on investment– except for the banks and the weapons-manufacturers. Modern American wars are now being fought by thoroughly indoctrinated, post-adolescent, Call of Duty-type first person shooter gamers who liked the adrenalin high of killing virtual “bad guys” in a videogame. Sadly, unbeknownst to them, they are at high risk of having their emotional and spiritual lives negatively and permanently altered by the physical, mental and spiritual damage that always comes from participating in actual homicidal violence. One theological blind spot about war was nicely illustrated near the end of “Joyeux Noel” in a powerful scene depicting a confrontation between the Christ-like, altruistic, antiwar, lowly Scottish chaplain and his pro-war over-privileged Anglican bishop. As the humble chaplain was mercifully administering the “last rites” to a dying soldier, he was approached by the bishop, who had come to chastise the chaplain for fraternizing with the enemy during the Christmas Truce. The bishop summarily relieved the simple pastor of his chaplaincy duties because of his “treasonous and shameful” Christ-like behavior on the battlefield. “Joyeux Noel” is an important film that deserves to be annual holiday viewing. It has ethical lessons far more powerful than the traditional fare of “It’s A Wonderful Life” or “A Christmas Carol”. Check out the video of McCutcheon singing his song below. Additional scenes from the movie, with the narration of a letter from one of the soldiers involved can be viewed below.